Handwriting changes under hypnosis. At top is the normal writing of a young man. 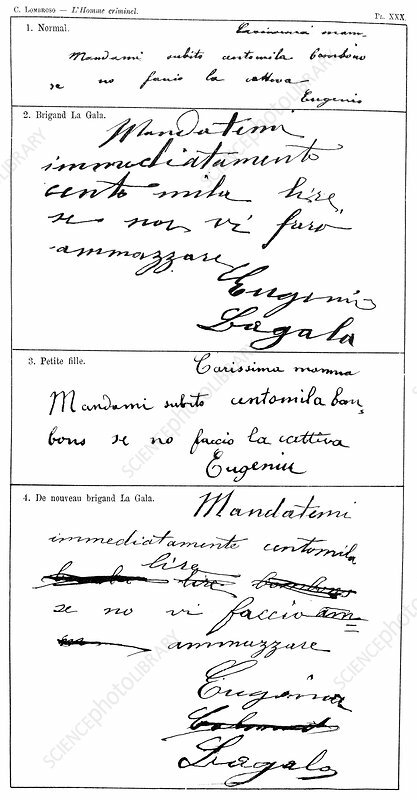 Under hypnotic suggestion, he is told he is the brigand La Gala, and the handwriting changes (upper centre). At lower centre, he is told he is a young child. At bottom, he has been told again he is the brigand La Gala. This illustration is from 'L'Homme Criminel', a French edition of 'L'Uomo Delinquente' (1876) by Italian criminologist and physician Cesare Lombroso (1835-1909), considered the father of criminology. His now-discredited theory (also rejected by many at the time) was that criminality was inherited and that criminals could be identified by physical traits.